Are your car and tires ready for winter in Boulder, CO? Ask about our FREE winterization and tire Inspection Special. Drive safe in 2019 by calling Independent Motors at (303) 449-8949 to book an appointment. In winter, Boulder’s roads and mountainous terrain can become treacherous to drive in. Streets can get wet, icy and covered in snow, resulting in hazardous driving conditions. The last thing you need is a broken down vehicle or an accident when it’s -20 Fahrenheit. Is your battery in good shape? Are your tires suitable for the driving conditions including ice and snow? Is your coolant protected enough for the cold? Are your lights operating as intended? Is your windshield wiper fluid topped up? Are your wipers in good shape? Keep in mind: your cooling system should maintain your engine at the correct operating temperature when it’s cold outside. If it isn’t working, your engine could be damaged. Also, it keeps the inside cabin at a comfortable temperature and your windshield free of ice and snow while driving. Is there anything worse than driving with a windshield covered in snow that you can’t see through? Schedule you free winterization and tire inspection today. 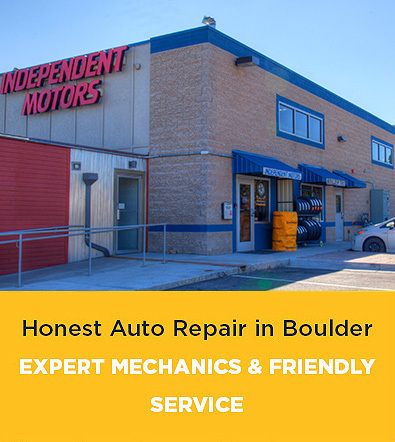 Call Independent Motors at (303) 449-8949 or book an appointment online. You’ll be glad you did!